What account should I map the Amazon reserve amount to? If you're configuring SellerZen manually, current and previous reserve amounts should be mapped to the same bank account. You'll need to create a bank account in your chart of accounts. Select "Bank" for the "Account Type" and then "Cash on hand." You can name this account "Amazon Reserve" for reference. 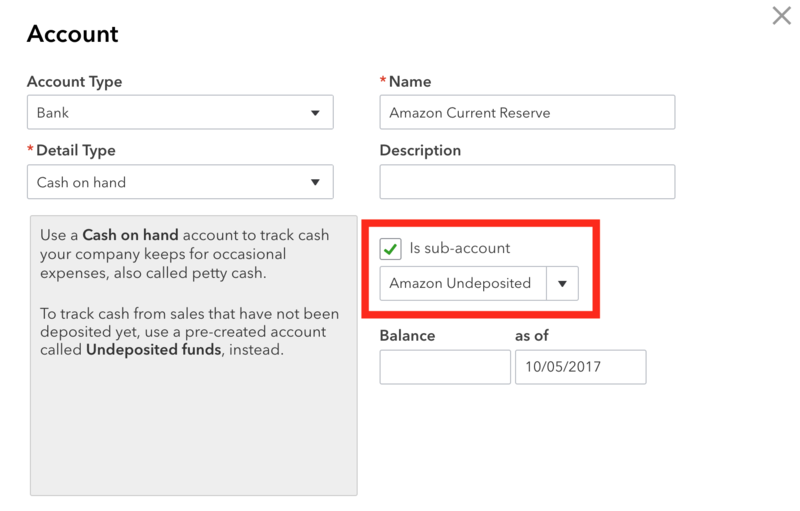 If you map both current and previous reserve funds to this account, then this account will always reflect the current reserve amount you have on Amazon. We also recommend that you make this a sub-account of your Amazon Undeposited Funds account. That way, one glance at the Undeposited Funds account will give you a clear picture of what to expect for the next settlement payout.